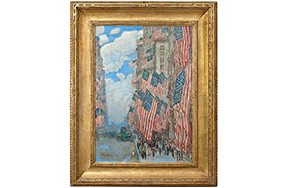 To honor the centennial of America’s involvement in World War I, the New-York Historical Society presents a special exhibition examining this monumental event through the eyes of artists. 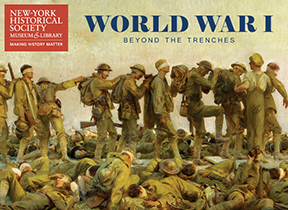 World War I Beyond the Trenches explores how artists across generations, aesthetic sensibilities, and the political spectrum used their work to depict, memorialize, promote, or oppose the divisive conflict. 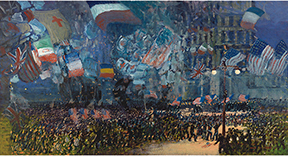 Featuring more than 55 artworks, the exhibition includes John Singer Sargent’s masterpiece Gassed, which has never traveled to New York before; Childe Hassam’s The Fourth of July, 1916, a recent gift from Chairman Emeritus Richard Gilder; and powerful works by George Bellows, Georgia O’Keeffe, Horace Pippin, and Claggett Wilson, among other American artists. Based on the recent exhibition World War I and American Art organized by the Pennsylvania Academy of the Fine Arts, the New York presentation features artifacts from New-York Historical’s collection to provide greater historical context, such as World War I propaganda posters, a soldier’s illustrated letters, contemporary sheet music, uniforms and military gear, a battlefield diorama with vintage toy soldiers from the recently-acquired Robert C. Postal Collection of Toy Soldiers, and a contemporary artwork by artist Debra Priestly. 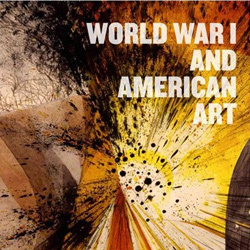 World War I and American Art was organized by the Pennsylvania Academy of the Fine Arts and curated by Robert Cozzolino, Anne Classen Knutson, and David M. Lubin. The exhibition is made possible in part by major grants from the National Endowment for the Humanities: Exploring the human endeavor, and from the Henry Luce Foundation. The Presenting Sponsor for this exhibition is the Exelon Foundation and PECO. Additional funding provided by grants from the David A. and Helen P. Horn Charitable Trust, Edwin L. Fountain, the Wyeth Foundation for American Art, The McCausland Foundation, the General Representation of the Government of Flanders to the USA, Mrs. Helen Horn Bickell, Carolyn Horn Seidle, Ellen and Leonard Milberg, Furthermore: a program of the J.M. Kaplan Fund, Bank of America, Mr. and Mrs. Beat Curti, Mr. and Mrs. Kevin F. Donohoe, Connie and Jules Kay, Dr. and Mrs. J. Brien Murphy, and Ken Woodcock. This exhibition is supported by an indemnity from the Federal Council on the Arts and the Humanities. 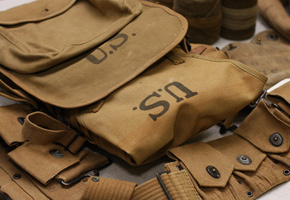 World War I Beyond the Trenches, the New-York Historical presentation, was curated by independent curator Robin Jaffee Frank, with Mike Thornton, New-York Historical’s associate curator of material culture, and is supported by the Mr. & Mrs. Raymond J. Horowitz Foundation for the Arts, Inc., Helen and Robert Appel, the Richard Lounsbery Foundation, Jennifer and John Monsky, and the General Delegation of the Government of Flanders to the USA. Exhibitions at the New-York Historical Society are made possible by Dr. Agnes Hsu-Tang and Oscar Tang, the Saunders Trust for American History, the New York City Department of Cultural Affairs, and the New York State Council on the Arts with the support of Governor Andrew Cuomo and the New York State Legislature. WNET is the media sponsor. 1916 ; Childe Hassam’s The Fourth of July and Claggett W Art Magazine artist Debra Priestly Ballet Broward by George Bellows California centennial of America’s involvement in World W des John Singer Sargent Europe Fine Art Magazine Florida Gassed Georgia O'Keeffe Horace Pippin Miami-Dade Naples New York New York Historical Society Museum & Library North Carolina Opera Palm Beach Theatre Visual art Magazine World Art “WORLD WAR I BEYOND THE TRENCHES"